The Mental Toughness for Success group with LNVC members Tuesday night. LANCASTER – At the Lancaster Neighborhood Vitalization Commission (LNVC) meeting Tuesday, commissioners recognized the volunteers, projects leaders, city staff and sponsors who took park in the 2012 UNITE (Uniting Neighbors in a Team Effort) Lancaster projects. This year’s event, which took place on Saturday, Sept. 22, drew about 800 participants who logged nearly 1,000 volunteer hours, according to city officials. Unity by Numbers II volunteers. From neighborhood cleanup efforts to a BBQ promoting bicycle safety, the seven UNITE Lancaster projects focused on strengthening community ties, enhancing public safety, and beautifying local neighborhoods. “It never ceases to amaze me how something as simple as painting paving stones, playing a game of chess, or tidying a yard can serve as a catalyst to bring people together,” said Mayor R. Rex Parris. “It’s just phenomenal to see people unite over these projects each year, taking pride in their community, getting to know their neighbors, and launching these unique community-building projects. 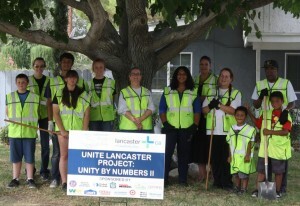 Although administered by Lancaster’s LNVC and Safer Stronger Neighborhoods Committee, all of the UNITE projects were originated by local residents who applied to become part of the city’s annual UNITE program. Back to School Boot Camp— This one-day boot camp helped prepare incoming 6th graders and their families at Endeavor Middle School, covering topics such as goal setting and bicycle safety. Facilitated by a team of parents, faculty and staff volunteers, the camp was held in late August and drew about 300 participants. Approximately 75 volunteers then participated in a clean-up day at the school on Saturday, Sept. 22. Historic BLVD District— Organized by a group of 30 neighborhood residents, this parkway planter rehabilitation project took place along Fig Avenue, between Oldfield and Newgrove Street. The residents also paid for a portion of the supplies and did the labor themselves, logging over 120 volunteer hours. Residents removed weeds and replaced turf areas with drought tolerant, low maintenance plants and decomposed granite. Mental Toughness for Success— Facilitated by the Lancaster Youth Development Foundation and local volunteers, this six-week program taught mentorship and life skills to 34 Lancaster youth. The program culminated on UNITE day, with participants offering free landscaping services and a general neighborhood cleanup to community residents within the El Dorado Community. The group of about 50 volunteers tackled 35 properties on UNITE day, logging approximately 300 volunteer hours overall. Monkey See, Monkey Do Community BBQ — This neighborhood BBQ drew around 200 participants and featured family-friendly activities, including a bicycle rodeo, pedestrian safety training, a BMX Bike Show, and a Zumba dance class. About 20 volunteers from the Monte Vista Parents Association and Monte Vista Elementary School hosted this project to improve bike and pedestrian safety, visibility, communication, and neighborhood relations. About 55 people took part in the Sticks & Stones: Heal the Bullying project. Sticks & Stones: Heal the Bullying— About 55 people participated in this community-based art project, which raised awareness about the harmful effects of name calling, hate speech, and bullying, while promoting resiliency and healing of those victimized by such words. 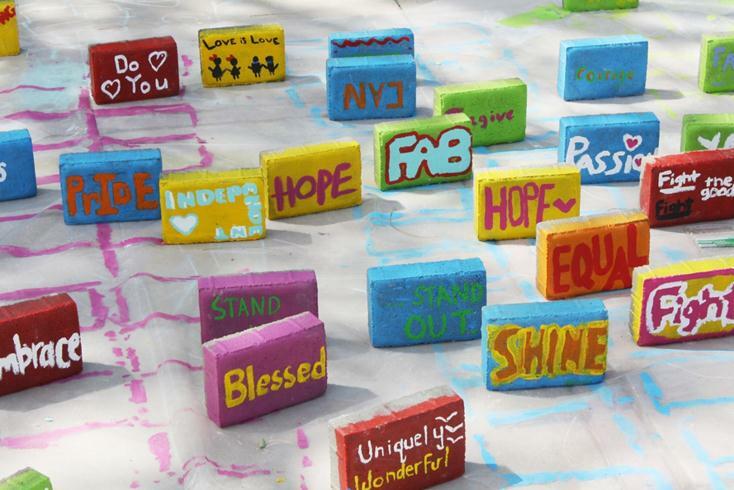 Hosted by the OUTreach Center, the project featured a youth art workshop where young people wrote the words that wounded them on flat paving stones, to be used to create a path of unity at El Dorado Park. UNITE Chess Program— Hosted at El Dorado Elementary School by AV Chess House’s Say Yes to Chess Program, this Scholastic Chess Mini-Game© Tournament introduced children grades K-6 to the joys of playing chess. About 50 children and adults participated. Unity by Numbers II—Volunteers painted and repainted house addresses on street curbs as part of this public safety project, which serves to aid emergency response teams in locating homes in the event of an emergency. The project also included a neighborhood cleanup component. Facilitated by members of the Baha’i Faith of Lancaster, along with local volunteers, the team of 12 painted addresses on 16 curbs and cleaned two yards in the El Dorado neighborhood. The group plans to continue the project throughout the coming months. 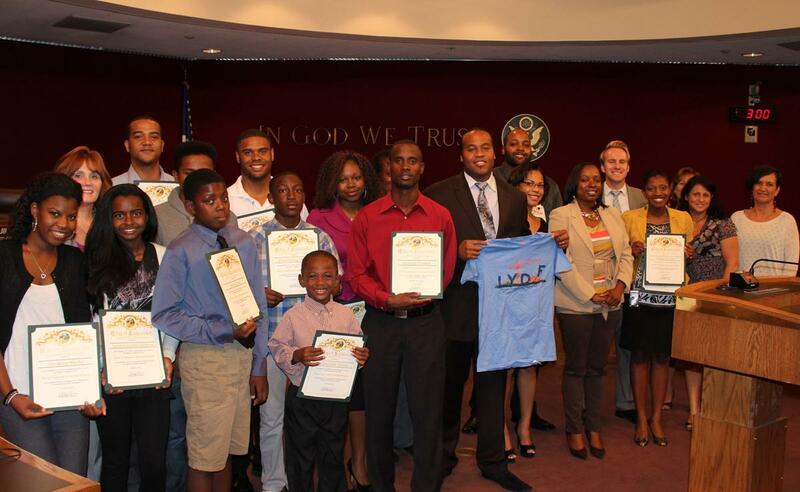 The 2012 UNITE program focused on the El Dorado neighborhood; the area from Avenue J to Lancaster Boulevard, and from Division Street to Challenger Way. While applications from throughout the City of Lancaster were accepted, applicants were encouraged to submit projects which targeted the El Dorado area. For more information regarding the UNITE program, visit www.cityoflancasterca.org/unite.